German director Werner Herzog has been making movies for 40 years, and at this point in his career, the legend very nearly eclipses the man. Herzog eating his shoe on a bet with Errol Morris, rescuing Joaquin Phoenix from an overturned car, and continuing an on-air interview after getting shot with an air rifle (“It was not a significant bullet”)—these are just some of the real-life tall tales he’s known for. As part of the vanguard of German filmmakers in the ’70s, including Wim Wenders and Rainer Werner Fassbinder, Herzog originally made his name on films that tackled the grand theme of man against nature, including such classics as Aguirre, The Wrath Of God; Fitzcarraldo; The Mystery Of Kaspar Hauser; and Stroszek. More recently, he’s struck a balance between first-person documentaries like Grizzly Man and Encounters At The End Of The World, and English-language features like Invincible and Rescue Dawn. Herzog’s latest effort, an in-name-only remake of Abel Ferrara’s controversial 1992 detective thriller Bad Lieutenant, has attracted intense curiosity since it was first announced, due in no small part to the casting of Nicolas Cage in the title role. The trailer was a viral hit, too, introducing several quotable lines and strange images into the pop-culture lexicon. As for the movie? Bad Lieutenant: Port Of Call New Orleans is a wild thriller starring Cage as a rogue detective battling his demons and searching for justice in the drug-related murder of Senegalese immigrants. Herzog recently spoke to The A.V. Club about Nicolas Cage, New Orleans, and his new Rogue Film School. The A.V. Club: Thinking about Bad Lieutenant in relation to your other work, it seems like your interest in location is one common denominator. Were the film set somewhere other than New Orleans, like Detroit as it was originally scripted, would it have interested you as much? Werner Herzog: Something strange happened, because from three sides, everybody converged on New Orleans. I got a call from the producer, Avi Lerner, and he was kind of apologetic, and he said, “Werner, should we consider shooting in Louisiana, to shoot in New Orleans, because we don’t have a lot of money and all this, and we’ll have some big tax incentives?” And I said to him, “Avi, it can’t get any better.” I think this is much, much better than any other city, because a hurricane had destroyed it, and civility had collapsed, and criminals were the first ones to return. And unbeknownst to Avi Lerner and me, Nicolas Cage was also pushing for New Orleans, because it’s apparently a very, very important place for him. And he liked the fluidity of it, the musicality of it, so all of a sudden, from all sides, we were pushing for New Orleans and thought the others were against it. AVC: Before making the film, had you been to New Orleans post-Katrina? WH: No, never before. I’d never been in New Orleans. Of course I knew about the city and I had seen the pictures, and I knew a lot about it, but I had never been there. AVC: Once you got there, how did you want the city to play a part in the movie? WH: Well, it was obvious that I wouldn’t go for the postcard clichés, so what you don’t see in this film is the French Quarter. What you don’t see is jazz clubs at 4 in the morning. What you don’t see is something like voodoo or jazz or whatever. All the clichés are out. I had a very, very short time for pre-production. I had to find something like 40 locations all within three or four weeks. I had to cast 35 speaking parts. I had to put together a crew in an extremely short period of time, so I was rushing around with people who knew the city very well, and they pointed out certain places for me, and I had to make very quick choices, literally on the run. AVC: In the past, you weren’t given to making genre films like this. 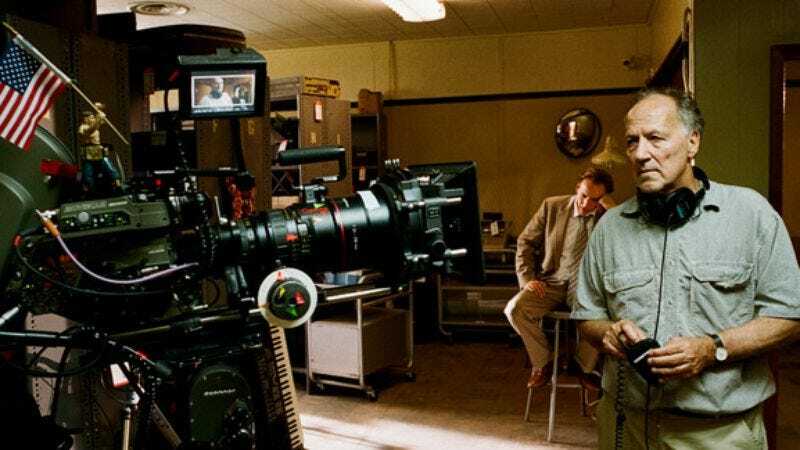 Were you comfortable dealing with the procedural elements of Bad Lieutenant? Was this a chance to reinvent the detective thriller in your own way? WH: I don’t know whether it’s really a genre film. Apparently it is, but I have very little experience with detective thrillers, because I’ve hardly seen any in my life. [Laughs.] So I can’t even argue, but of course, in a way, it belongs to a genre. Marginally. I think you’re asking me too much, because my knowledge is limited. AVC: But you still have to satisfy certain elements of the script. There’s a mystery to be solved. WH: There was no learning curve for me on that. There was no time for learning curves. But it doesn’t matter. You see, you can throw anything at me and I will cope with it. [Laughs.] It was a great joy to make this film, and there was a feeling of something hilarious at the same time. Whenever we started a scene, we kind of knew deep inside that it was going to be hilarious. AVC: So you really saw this as more dark comedy than procedural thriller? WH: I had the feeling while I was shooting that finally here was a film where audiences would recognize that there’s a lot of sometimes very dark humor in my movies. When you see the film with the audience, there’s more laughter than in an Eddie Murphy comedy. AVC: And you’re happy with that? WH: Of course, of course, of course. It can’t get any better. AVC: Nicolas Cage’s performance is free and unhinged. What kind of conversations did you have with him going in about how he was going to play this role? How would you describe your working relationship once you got on the set? WH: Our working relationship was established within less than 60 seconds in the phone call. In the phone conversation, he was in Australia, and we were in business in less than 60 seconds. It was clear he wanted to do the film, but only if I was on board, and I said that I will only sign if he was on board, so there was a relationship of mutual trust before we had even seen each other. Both of us found it some sort of an outrage that having looked at each other’s work, it had never occurred to us that we should work together. [Laughs.] So it was kind of outrageous. It dawned on us suddenly that we had to do this. And then of course… what was your question? I lost it a little bit, sorry. AVC: What did you tell him about how to play the character? WH: You see, with actors, normally I don’t like to have any conversation about background and about motivations and all this. I think on the first or second day of shooting, Nicolas, who is a very shy man, came to me and said “Werner, I know you hate these kind of Lee Strasberg Actors Studio questions about motivation, but what makes him so bad? Is it the drugs? Is it Katrina? Is it his injuries?” And I said, “Yeah, well, let’s not discuss that. But there’s such a thing as the bliss of evil. Let’s go straight for that. Enjoy yourself as much as you can, doing the worst thing, the most debased and vile things, but enjoy yourself, because the audience will somehow, I hope, be in a secret conspiracy with you that sometimes we love to be vile and debased.” It’s a secret joy, and that makes it so hilarious, I think. AVC: Evil for its own sake? WH: Sure. And then we had moments—and some of them are the most remarkable in his performance—where I understood he needed to be like music, and I had to give him the space and the time and the possibility of playing out wild facets. For example, when he intimidated two elderly ladies with his gun, that was only halfway scripted. It ends in wild improvisation. AVC: The other striking thing about that particular scene was the electric shaver. Where did that come from? AVC: Did you feel you had the same license then as a filmmaker as well? If he was turning the hog loose, were you also doing things with the camera that maybe you wouldn’t be inclined to do otherwise? WH: Oh yes. I turned the hog loose when I filmed the iguanas. It was actually me who filmed it, and it was not in the screenplay. For example, “the dancing soul” is not in the screenplay. And that again is the beauty of filmmaking. You can invent. I think the worst that can happen in filmmaking is if you’re working with a storyboard. That kills all intuition, all fantasy, all creativity. AVC: Your documentaries have an exploratory, sometimes digressive quality that leads to surprising revelations. Do you take a similar approach to fiction films? How much do you like to prepare beforehand, and to what degree do you let the process take you somewhere else? WH: You should bear in mind that almost all my documentaries are feature films in disguise. Because I stylize, I invent, there’s a lot of fantasy in it—not for creating a fraud, but exactly the contrary, to create a deeper form of truth, which is not fact-related. Facts hardly ever give you any truth, and that’s a mistake of cinéma vérité, because they always postulate it as if facts would constitute truth. In that case, my answer is that the phone directory of Manhattan is a book of books. Because it has 4 million entries, and they are all factually correct, but it doesn’t illuminate us. You see, I do things for creating moments that illuminate you as an audience, and the same thing happens with feature films as well. AVC: The line between the two things is not as clear as people might assume, or might make them out to be. WH: Yeah, sure, sure. And I don’t care whether there’s a borderline or not. AVC: So applications are presumably rolling in for your Rogue Film School. What inspired the idea? And how has the response been so far? WH: I’d talked about creating a different film school for a long, long time. For at least 20 years, I said we should have a different type, a guerilla-type film school where you don’t really learn any practical things. For that, you have to apply to your local film school. It’s much more of an attitude, and if you look at what I write about the Rogue Film School on the website, it makes a clear point that this is something different, and this is much more intense, and we are going to talk about things that you will never learn in a film school. A rogue attitude. How to pick locks, how to forge a document, and how to survive things that are normally not foreseeable in filmmaking. So it’s a certain type of spirit, and that’s why, for example, I gave a recommended reading list. And the recommended reading list includes Virgil’s Georgics, which nobody ever reads, but it had been extremely important for my film in Antarctica, Encounters At The End Of The World. It includes thousand-year-old Icelandic poetry and things like this. That ultimately will make you a filmmaker, and not what you know technically about it. AVC: And the response has been good so far? WH: Very, very intense. It’s kind of crazy. Way, way too many applicants. I am flooded, and of course they all have to send in DVDs of their short films, so I’m scrambling to watch them all. I take everyone seriously. I study their applications, what they write in their applications, I check the DVDs—actually, two more persons are checking it parallel, because I want to have some outside evaluation. It’s going to be very interesting, and there are so many questions coming at me that I added another day to this first seminar, so it’s Friday, Saturday, Sunday, and Monday now, early in January.